Along with most allotmenteers, I am heartily sick of all the wet. 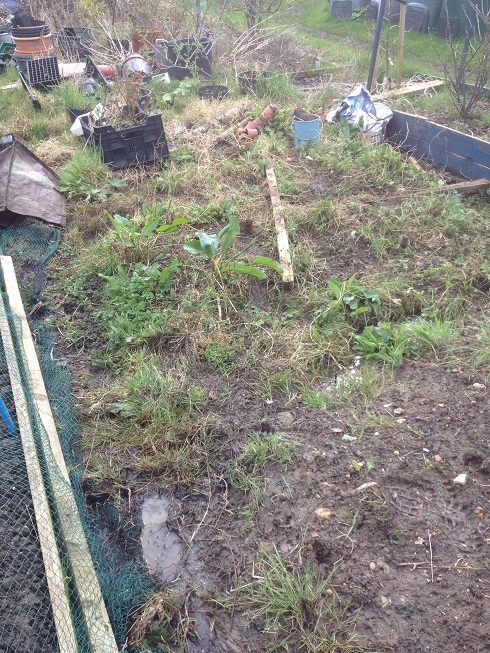 I have standing water on my plots and most of the raised beds are pond-like just six inches down. It feels very similar to 2012, when I started out on plot #100 and most of my potatoes drowned. My fruit cage challenge has begun. I have ripped off most of the creeping grasses and old weed stalks from the top of the bed-to-be. Which is probably where lots of the splatting happened. The surface water is an inch or two in places. Frogs like it though – there are lots of yellow and black jumpy bodies and I just wish they would turn more of their attention to my local slug population. As soon as it dries out a bit I can turn my attention to some serious digging & eradication of tap-rooted evil. The few things I have sown or planted seem to be coping well. In the greenhouse I have 100% germination on 2-year old Magnolia Blossom Tendril Peas, broad beans have only minor slug damage so far and wild garlic is poking up in the hedgerow. Admittedly the latter was planted 2 years ago, but it looks to have bulked up a little more than last year so perhaps it’s finally established enough to start spreading. Rather belatedly I’ve embarked on Dahlia Rescue. 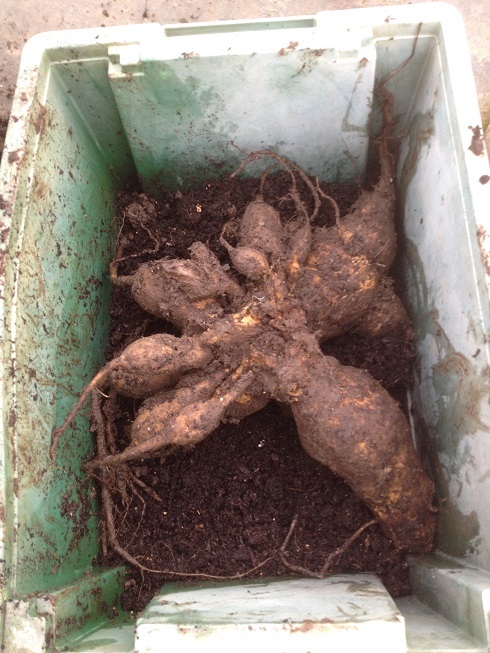 Surprisingly, given the horrible sucking sound made by the soil, most of the tubers are sound – rotting dahlia tuber is a smell that truly turns your stomach. The little tubers shoved into a bed of almost 50/50 manure & soil last year have grown to an immense size. Dark Butterfly is bigger than all the pots I have and has had to go into a crate. All of them are being painstakingly rinsed free of the slug eggs a careful slimy parent has laid amongst the roots. There are a couple of other small issues. Firstly, I didn’t think any of them would have survived winter, what with all the frosts, snow and general wet. So I bought 5 more: Striped Vulcan, Hanan Gold (might be Hamari – the writing on the paper bag is blurry and I can’t find a variety called Hanan anywhere), Verrone’s Obsidian, Gerrie Hoek and Vino. I will need to be inventive in finding space to put them all. Seed sowathons have begun in earnest at Mudandgluts Towers. All the tomatoes are in and chillies have been sown with devout finger-crossings that I will still get a crop. I haven’t done a plan for this year, which makes me a bit nervous. I know I will forget something important if I don’t have a plan – like sweetcorn for example, and a plot without sweetcorn is a very sad thing. And in other news, after 30+ years of long hair, it’s now something of an asymmetrical crop. The verdict is still out on whether I look more like a Bananarama reject or a Cold War spy. When I have a less gloomily-lit photo the profile pictures on this blog will also get a revamp. And thanks, it took a bit of getting used to but now I wish I’d done it years ago! The solution is chocolate. It won’t get rid of the wet but it’ll make you feel better. Don’t worry, it will get better (one day). Were I to say that your new hairstyle makes you look years younger I’d probably be offending some PC rule so though it does, I won’t. I left half of my dahlias in the ground over winter as an experiment. I’ve never smelt rotting dahlia tubers before so thanks for the warning! Thank you – kind words rarely offend…;) Given I am fast approaching a birthday with a big fat zero in it, anything that takes a few years off is welcome. My dahlias are waking up in their assorted pot/tins/crates. It’s very exciting! Hope yours have survived. I do like your snazzy raised beds – they look fantastic. Sounds much like my own plot here in Northumberland – wet, cold, grim *yuck!!! * – what a rotten six weeks it has been since the end of February! My living room windowsill is covered in pots of young plug plants, the spare room still has chitting potatoes in there and the greenhouse on the allotment is still being used to store my more tender flowers which I will have to start hardening off ASAP…..just so I can make space for veg seed sowing! I’m so disorganised this year and, like yourself, haven’t even made a layout plan yet. The forecast is for warmer temperatures next week however so time to get stuck in – perhaps tomorrow when I have a day off work I shall get my boxes of seeds out and sort out what to grow and do a plan from there. Oh, and I like your hair too….after 15+ years of long hair myself I had it cut short in December and it’s so much easier to look after now. Thank you! Short hair is a godsend now it’s getting hotter. I am assuming this year we are skipping spring and moving right into summer! I have started sowing, but it will be a few focused hours with compost and tins before I am caught up. Good luck with your plan and seed-tray-shuffling. Great haircut, tried some angled shaping myself about 2 years ago, while I really liked it I just can’t bare fussing so it has gone to curly untidiness. Great to see the blog, Thanks for sharing sixonsat am thoroughly enjoying reading and contributing to that one. Thanks! Bedhead is something I’d forgotten about in all the years of long hair…Am going to try to participate in SixonSat once a month – though that might be too organised for me!